Lotta Sea Lice is the result of 8 days in the studio spread over almost 15 months when Courtney and Kurt's respective touring schedules allowed for them to be in the same place at the same time. Kurt Vile: "We ran into each other on the road in various continents and talked about the recordings. I guess it wasn't till i had another tour booked for the following summer in Australia that we thought we should record as much as we can, no major goal to make it a full length but it came together that way because the vibe was so strong. I love working with Courtney, the collaboration was laid back with less pressure." 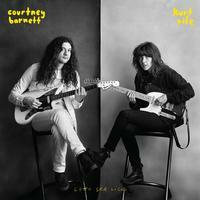 Courtney Barnett: "Now we finished the album, we dreamt up an amazing band which we've called The Sea Lice (inspired by a Stella Mozgawa beach-side-story) and me 'n' Kurt will be standing there out front with our guitars singing songs together. Songs from this album we did, a handful of our own songs from previous albums, maybe some old folk songs n what not. Harmonies and guitarmonies galore. Very collaborative."